There are a lot of real small Bluetooth/WiFi antennas in the market. Most of them are monpole ceramic antennas. 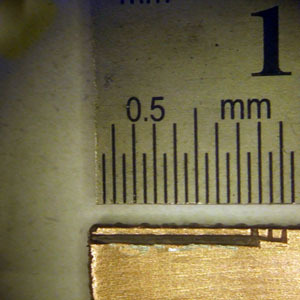 These antennas do often result in limited performance and some of them require a rather big footprint as they need a certain distance on PCB that is free of ground plane or other components. In the end are these antenna neither easy or small to implement. Size: 6*2*1 mm. Peak efficiency: 68%. External matching required. Data sheet says that this performance was measured on a FR4 PCB 100*40 mm with antenna placed in an 40*15 mm area were surrounding ground must be removed. Data sheet does also state that it is possible to reduce this area, but antenna performance will then drop. 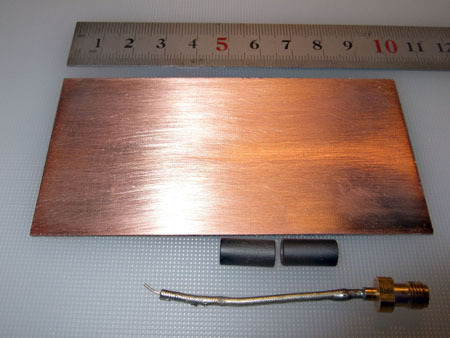 The antenna element is small but it requires in total a relative big PCB area. How to design a real small PCB antenna, with aid of AnTune software. This is a simple embedded BT or Wi-Fi antenna design (2400-2480 MHz) demonstration including basic instructions how to perform antenna tuning with aid of AnTune software. Goal is to make an antenna that is simple to implement in a extremly limited space and footprint. From antenna design to final optimized matched network, including basic antenna report and BOM will development time be less then 10 minutes, using AnTune. Without AnTune can this type of antenna design including writing basic documentation take several hours and result will still maybe not be best possible. Ground plane is a single side FR4 PCB, 50*100 mm. 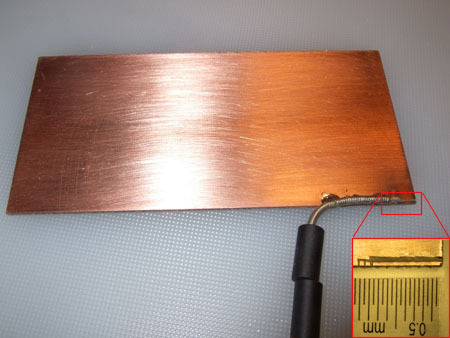 The antenna is a small hand cut PCB stripe, 8*1 mm, with 1 mm isolation to surrounding ground. 8 mm corresponds to 6.6% of full wavelength in air for actual frequency. No clever antenna size calculations are done. Size is selected to be small, that's all. Total occupied PCB area is 2*9 mm including clearance from ground. Due to antenna size relative to wavelength will it result in a very high impedance, at the limit of what the VNA that is used for this impedance measurement can handle. This type of high impedance antennas can be frustating to find how to make them perform as good as possible. Finding best matching network and finding correct component values requires a lot of trial and error. AnTune calculates best network design and select optimized component values by either import a S11 parameter file or by direct reading from a VNA. Result is presented without delays. If the VNA can deliver data 10 times pro secound, will AnTune present optimized calculations at same rate. In this example design is PCB prepared for a small matching network, size 0402 or 0201. That is why two small CU isles are done near the antenna. A measurement coaxial cable is connected to antenna pattern. Start VNA, calibrate and adjust for electrical length at actual place for the matching components. This is a critical procedure. If calibration not is done correct, at PCB level, is this kind of antenna tuning not possible or it will result in wrong matching component values as untuned antenna impedance from beginning is long away from whished impedance. Matching network will be implemented in steps in video below. As this is a real simple job is it maybe not necessary, but it reduces risk that something goes wrong. Whole matching procedure in AnTune, including initial setup, can be seen in this video. The video is 7 minutes long and that was the actual time spent on this antenna matching. 1. Save the by AnTune calculated tuning curve and component values for the matching network that AnTune propose as a first documentation. 2. Solder the first component, the component closest to the antenna. 3. Set up AnTune network configuration for the remaining two components, and verify that it shows same curve as the one predicted at #1. Save result. 4. Loop to #3 for the remaining components. 5. Last component is soldered and final VSWR is verified to to be just as good as AnTune did predict in step 1. Push the button to save a measurement report. Resulting VSWR is below 1:3, but the big question is, can a such small antenna radiate anything at all? To make this design demo a bit more complete was the antenna efficiency later measured in a reverberation chamber. 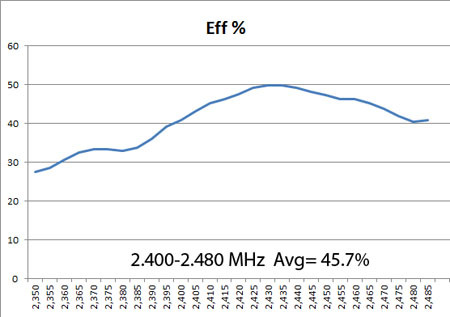 The antenna measured 45% average efficiency. 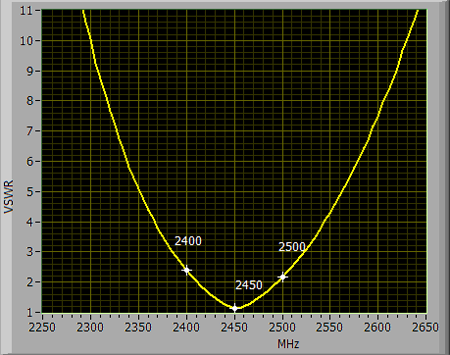 Not bad for a such small antenna with minimum requirement for PCB area and minimal isolation from ground. Final measured VSWR with real components at PCB. VSWR is possible to improve by adding a more complex matching network, but it is acceptable as it is for most applications. Antenna efficiency is acceptable for many mobile applications. If total size have high priority, such as in a Bluetooth headset is it an very preferable antenna. Antenna total PCB footprint is 18mm2 (9*2 mm). PCB antenna cost is minimal as it is a part of PCB pattern. If needed, are antenna improvements possible by increasing antenna ground distance or increase antenna length by making thinner CU trace allowing for a meandring pattern, it all depend on actual design situation. If PCB is dual side, do not forget the possibility to use both layers for antenna pattern. It can result in measureable improvement for no increased footprint or production cost. Link to measurement document automatic created by AnTune in the video. Resulting network component values are not the same in a different antenna environment. Required antenna matching can change a lot even for minor adjustments of antenna size, brand of PCB material, size and shape of ground plane. The antenna is a monopole antenna, => half the antenna is the ground plane and a different shaped ground plane affect tuning values. Not mixing capacitor and inductors with too extreme impedance ratio which can cause losses due to non ideal effects. Avoid self resonances for each component as well as avoiding resonances for the whole network, within tuned frequency range. Network solutions that require narrow component tolerances are also avoided, if alternative solutions exist. AnTune will tell if selected inductor family not is suited for actual frequency range. Using AnTune for implementing a network is easy and simple as critical solutions are avoided and final result is very similar to what AnTune did predict. For more complex designs, designing embedded multiband antennas or matching any network with irregular complex impedance in both ends, is AnTune a real time-saver. Differences in time with or without AnTune can be several days for complicated antennas. The possibility to easy match antennas for best TIS and TRP over a wide frequency range can be a difference of several dB's in total performance compared to tuning with 50 Ohm as single goal. AnTune was here neither used to interactively find best antenna shape or placement, which else is another benefit of AnTune. A not so technical but still important function in AnTune is that it is a single click procedure to do required actions or save results during filter or antenna development. Compare this with most VNA's, it is not very practical to save results, and these results are very anonymous. No one remember what a cryptic file name was about, not even next day. In AnTune is it very easy to save each design step, and by this way avoiding that antenna design can goes wrong, and if it does, with AnTune is it easy to find where and when. These saved results are also valuable for later reuse and timesaving source for writing measurement reports. Download a time limited, fully working version of AnTune here, to find out if AnTune fulfill what it promises.